Some of the stuff we eat isn't fit for a dog. 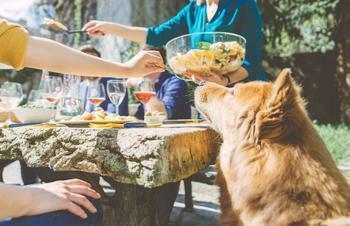 That's the warning from the U.S. Food and Drug Administration (FDA), which recently issued one of its periodic warnings that, while we may think of our pets as members of the family, they shouldn't eat from our table. While it's true that all mammals are somewhat similar, there are some very important differences between humans and dogs. “Our bodies may break down foods or other chemicals that a dog’s can’t tolerate,” said Carmela Stamper, D.V.M., an FDA veterinarian. She also notes that dogs have widely varying tolerances for different foods -- what one dog eats with no problem may sicken others. “A big lab that eats a bar of dark chocolate may not have any problems,” she says, whereas a Chihuahua could get dangerously ill. Allergies are also an issue. Dogs have them just as humans do, but they tend to manifest themselves differently, showing up more as skin and ear issues in dogs, she said. Raw meat, which can contain E. coli, Salmonella, or other harmful bacteria. If you’re making hamburger patties or setting out steaks and chicken breasts for the barbecue, for instance, make sure they’re well out of reach of your counter-surfing canines; you’re not doing them any favors by tossing a chunk or two. Grapes, raisins, and currants can cause kidney failure in some dogs. Stamper says not all dogs are affected, but if you think you’re handing your dog a healthy snack, you could be disastrously wrong. Other fruits, like apples and bananas, are OK but don’t feed your dog the core or seeds. Fried and fatty foods can not only give your dog a stomachache, but can also cause a potentially life-threatening disease called pancreatitis. Even if your dog is eyeing the fried chicken with longing, resist the temptation to give him his own piece to chew on. Moldy foods are not something you would feed your family, and your dog shouldn’t eat them either. If you put moldy cheese rinds or hamburger buns in the trash can, make sure your dog doesn’t then get into the garbage. Onions, garlic, and chives (as well as onion and garlic powder) can be harmful to your dog, especially in large amounts. Salty snacks, in large quantities, could also cause problems in your dog. “Feeding the odd potato chip or pretzel probably won’t do any harm,” Stamper says. But if your dog gets into a whole bag of them, he could get really sick. Chocolate and xylitol, a sugar substitute used in many sugarless products, can be deadly for dogs. Xylitol is found in sugarless gum, candies, oral products, some peanut butters, and other nut butters. You don't have to worry as much about cats. They're much pickier eaters than dogs and do not often get into trouble by eating foods that will harm them, Stamper says. She adds, however, that cats are super-sensitive to onions, garlic, and onion and garlic powders, so make sure your cat has no opportunity to eat foods made with these ingredients.